In recent years, on the way of development, Vovinam has been many organizations and social sectors concerned. Besides the center, club sports, school, several temples Vovinam also organize workshops in order to create a healthy playground, contribute moral education, physical exercise for youth and Buddha mail. According to incomplete understanding, at least 3 pagoda in Ho Chi Minh City held a free Vovinam class for clergy, lay people and youth, students – a good religious activities, good life. 1. “Standing to areas remote to preaching, I heard many Buddhists expressed anxieties before the phenomenon moral degradation of society. The moral education for the younger generation is difficult and sometimes parents feel helpless, etc. Since then, I always concerned and wanted to do something to contribute to their moral teaching … But until now been tasked this Pagoda in August 2011, I had the conditions for implementation his wishes, which is organizing a healthy playground for young people “, Venerable Thich Tinh Tam – commissioners central propagation, Linh Hoang Pagoda, An Nhon Tay Commune, Cu Chi District (Cities HCM) talked with us about the cause of the organization Vovinam martial arts class. However, the organization of a martial arts training class to suit a restless young people is not easy. Venerable Tinh Tam had contact with a few of martial arts, but failed, because the temple could not afford allowances 5-6 million every month for training board. Venerable Tinh Tam Next: “But then fortunate also to. A disciple in this community know Coach Nguyen Hoai Van (student Master Nguyen Chanh Tu, member of the Board of Managing Masters Vovinam-Vietnam Vo Dao) teaching Vovinam Free Buddhist monastery Vulture (Phu Hoa Dong, Cu Chi) so I invite Mr. Van to this exchange. Mr. Hoai Van happy being accepted to support the approval of the People’s Committee of An Nhon Tay, Center for Sport and Society Cu Chi Vietnam Vo Dao Ho Chi Minh City, free Vovinam class at Temple was opened May 17, 2014 “. At first, the class attracted nearly 250 children under 3 in An Nhon Tay, Phu Nhuan Duc and, even now there are also regular refresher 170-180 children 3 sessions / week from 17 hours to 18 hours on day 30 Tuesdays, Thursdays and Saturdays. Not only that, in parallel with the martial class has a class Ayurvedic Vo Dao Vietnam with about 20 parents and Buddhists participate. “When the class is about to start, a number of Buddhist women fear they will cause meditation subjects noisy place, but after class in order, see more good martial arts students, all Buddhists are relieved and happy to face. And belt buckle belt examination Lam belt first grade was held on December 14, 2014 “, the Venerable Tinh Tam delighted adds. 2. Before class at the temple Hoang Linh Vovinam, a free Vovinam class was held at the Buddhist monastery Vulture. 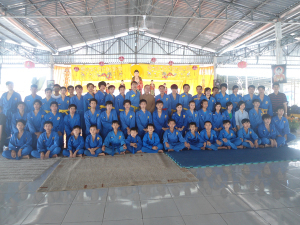 By Coach Hoai Van, Venerable Thich Thien Xuan – abbot Vulture – each episode Vovinam with Master Nguyen Chanh Tu at Dam Sen Cultural Park (District 11) should be transferred to the monastery when Vulture, university Lord opened the Vovinam classes for the children free of Buddhists in the area from June 15, 2010, attracted 40 martial born. In summer there are up to 60 children at class. But the effort and time for 2 classes a lot, but the Board did not receive remuneration training, but whether this is a small contribution to development of Vovinam-Vietnam Vo Dao and help children in remote areas. Hoai Van coach said: “As a child I too sickly. Since joining Vovinam with Mr. Tu, a lot healthier than I should only want to help the young people alone! And prolonged courses of today is thanks to the help of Vietnam Vo Dao Association of Ho Chi Minh City, Nguyen Chanh Tu teacher assistant with the children such as Chau Minh Trong, Chan Tong, Nguyen Duc Duy Vo Hoang Law, Nguyen Khanh Duy Vo Hoang Linh pagoda Ming Hao Nguyen Minh Tri or, Phung Van Hanh Doan Tuan Truong in monasteries Vulture “. 3. If in the temple Hoang Linh or monastery Vulture are few novices or novices joined the practice, then at Hoang Phap Pagoda, Tan Hiep Commune, Hoc Mon district, Ho Chi Minh City has quite a Vovinam classes for nearly 40 monks in the temple workout to elaborate, labor and learning. According to Mr. Hoang Pagoda France, “its conception of Vovinam martial is no upper station, no challenge, only use force in self-defense and sensitize people and not use force for punishment revenge should fit with the spirit Compassionate Bhagavan “. This class opened from May 5-2012 Quang Phuc by European masters, Dao Vu Minh Lam (student of grandmaster Tran Van My, members of the Board of Managing Masters Vovinam and coach Nguyen Van Hoa direction guide on Mondays, Wednesdays and Fridays from 19 hours 30 to 21 hours. Do many monks turn assigned to go to other temples so little class gradually and now has only 7 students. In promotion examinations Middle class level by the Ho Chi Minh City Vovinam held at Arena Sports Centre District 8 Ho Chi Minh City December 21, 2014, Hoang Phap Pagoda 6 students are up Yellow belt and 1 Yellow Belt II students up, while monastery Vulture 1 students to Yellow Belt and Yellow Belt 2 students on European Masters Quang Phuc I. adds: “Although the temple has put the issue allowances for the coaching staff, but we did not get that donated back to the temple. In May 10-2014, the temple also began to teach Vovinam classes for 20 Buddhist monastic prepared. It is expected to 2015, the temple will open Dharmadutha a Vovinam classes for the Buddhists in the region “. It is reported that European masters Quang Phuc was a mathematics teacher in junior high school and also from a dozen vegetarian this year.